Why this Kapoor Trio was MISSING at Krishna Ji's funeral? 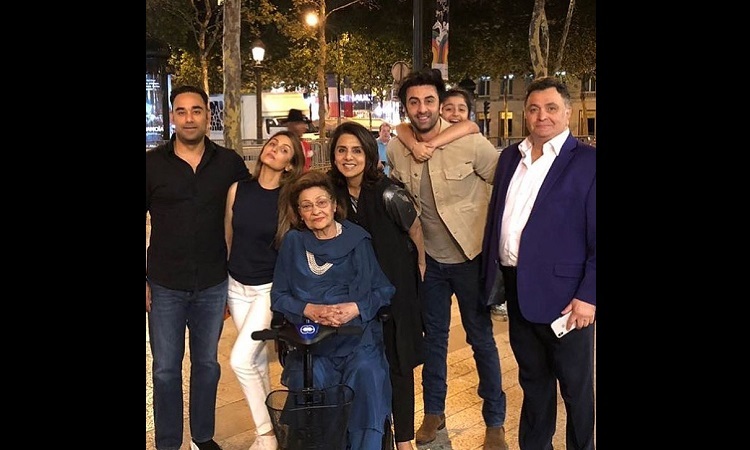 October 1, 2018, turned out to be a black day for the Kapoor family, as Krishna Raj Kapoor the pillar of the family passed away at the age of 87 due to cardiac arrest. She was married to the late legendary actor Raj Kapoor in 1946. She is survived by five children Randhir Kapoor, Ritu Kapoor Nanda, Rishi Kapoor, Rima Kapoor Jain, and Rajiv Kapoor. On Monday evening B-town celebs including Amitabh Bachchan, Aamir Khan, Sanjay Dutt, Aishwarya Rai Bachchan, Kajol, Rani Mukerji, Boney Kapoor, Arjun Kapoor and the entire Kapoor family including Krishnaji's grandchildren Kareena Kapoor Khan and Karisma Kapoor had come to bid a final goodbye to Krishna Ji at the ancestral Kapoor residence. But, Rishi Kapoor, Ranbir Kapoor, and Neetu Singh were seen nowhere to be seen. The reason for this is, they are out of the country. As reported earlier, Rishi has flown down to the US for his medical treatment and his wife and son have accompanied him there, following which they couldn't make it to the last rites. On Saturday Rishi Kapoor had tweeted, "Hello all! I am taking a short leave of absence from work to go to America for some medical treatment. I urge my well-wishers not to worry or unnecessarily speculate. It's been 45 years "plus"of wear and tear at the movies. With your love and good wishes,I will be back soon!". Randhir Kapoor had confirmed the demise of his mother, saying, "My mother passed away at about 5 am today due to cardiac arrest...old age was another factor. We are deeply saddened by her demise." Tummbad and Andhadhun win BIG at Critics Choice Film Awards!